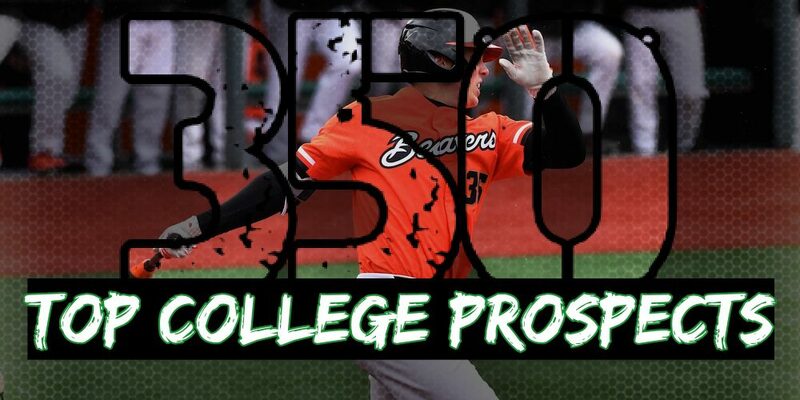 We’re less than two weeks away from the beginning of the 2019 college baseball season, and the hierarchy of draft prospects is finally taking shape with the release of the D1Baseball College Top 350 Prospects list. Our last update came in early December, where there was a mild shakeup in the Top 10. West Virginia’s Alex Manoah was in the Top 10 in our September list, while Auburn’s Will Holland replaced him in the December list. No changes have been made to the Top 10, where Oregon State’s Adley Rutschman and California’s Andrew Vaughn lead the charge. Baylor’s Shea Langeliers comes in at No. 3, while electric Duke lefthander Graeme Stinson comes in at No. 4. The top five is rounded out by hard-hitting Texas Tech third baseman Josh Jung, while Kentucky’s Zack Thompson and TCU’s Nick Lodolo have similar profiles. Both have electric stuff and a ton of upside, but also have something to prove this spring. Vanderbilt, the nation’s preseason top-ranked team, leads the way in terms of prospects in our Top 350 with nine players on the list, while two ACC teams — Georgia Tech and Louisville — each have nine players on the list. Florida, LSU, Mississippi State, Oregon State and Texas Tech are next in line with six representatives each, while Arkansas, North Carolina, Stanford, TCU and Texas Tech also are well represented with five players on the list. The college prospect rankings are assembled by Kendall Rogers and Aaron Fitt and are headlined by scouting director David Seifert.